The documentaries that comprise Austrian director Michael Glawogger’s so-called Trilogy on Work are three of the most striking and beautiful movies you’re ever likely to see. Megacities, Workingman’s Death, and Whore’s Glory are singular achievements, with a truly global scope and a rigorous, humanistic engagement with the people and places they explore. These films offer profound and unprecedented views of often overlooked aspects of modern globalized society: the poor, the marginalized, the working class, they all struggle, hustle — in short, work — to adapt and survive in the modern world. Megacities takes as its subject people living on the margins of four urban metropolises: New York, Mumbai, Moscow, and Mexico City. In Workingman’s Death, Glawogger depicts the extreme working conditions of manual laborers across the world: coal-miners in Ukraine, sulfur carriers in Indonesia, butchers in Nigeria, ship-breakers in Pakistan, and steel workers in China. “Whores’ Glory,” the best known of the three, portrays the lives and work of prostitutes in Thailand, Bangladesh, and Mexico City. Though these films show the harsh reality lived by oppressed people, what makes them remarkable is their beauty. In the midst of strife and struggle, Glawogger sees the elegance and dignity. Where another filmmaker might take the condescending view of the outsider, Glawogger’s films are compassionate investigations of the lives of these individuals from their perspective, and as such show not just desolation, but happiness, camaraderie, trivialities, and discontent. Glawogger’s greatest strength is not the power of his voice, but his dedication to and respect of the voices of those he films. More than anything, these films portray truth; the truth of labor, livelihood, and existence. In this way, the subject of the trilogy is at once general and specific, global and individual — they show, unflinchingly, how people live in the world. Glawogger died of malaria in April while filming a movie in Liberia. In an interview in 2012, when asked about the difficulty of filming prostitutes for Whores’ Glory, Glawogger responded, “It is difficult, but there's one thing I hate which is filmmakers who brag about the difficulty of their shooting, I really hate that with all my senses, so I'm not going to do it!” In watching his films, it’s obvious that the director put himself in difficult situations to capture the conditions of his subjects. But perhaps the most impressive aspect of Glawogger’s art is his insistence on remaining in the background, on letting the people and films speak for themselves. Michael Glawogger was one of the greatest filmmakers of our time, and he and the films he will never make will be sorely missed. Don DeLillo’s most recent novel, his fifteenth, is a slender masterpiece. In 117 pages DeLillo has written a novel so slim that I managed to read it in one three-hour sitting, and so chilling that, having finished it at two in the morning, I was afraid to leave my room and go into the kitchen, even though I was badly in need of a glass of water. What’s weird is that this isn’t a horror novel; not in the least. Point Omega, perhaps more than anything else, is a meditation on time, as the first and final chapters present us with a character obsessively watching 24 Hour Psycho, a version of the famous Hitchcock movie, slowed so that the film took nearly a day to watch. It is also, ostensibly, a meditation on war; one of the novel’s protagonists is a government official who devised the Iraq War, and has since retired to the Arizonan desert to meditate on the nature of the universe; the other is a documentarian who wants to interview him for his next film. The book is classic DeLillo — funny, sharp, and cerebral. But there is something haunting about this novel that is hard to articulate. Fellow National Book Award winner Colum McCann said that of all DeLillo’s novels this is “the one that takes the skin away, that sings at the deep raw edge.” Three months after having read it, this novel is still, incessantly so, in my thoughts. Though I am no longer afraid to walk around my house at night, it is clear to me that few, if any, American writers, whether their novels are 100 pages or 1,000, can write with such lucid profundity as DeLillo. This is, for me, even among such classics as Underworld, Libra, and White Noise, the essential DeLillo novel. 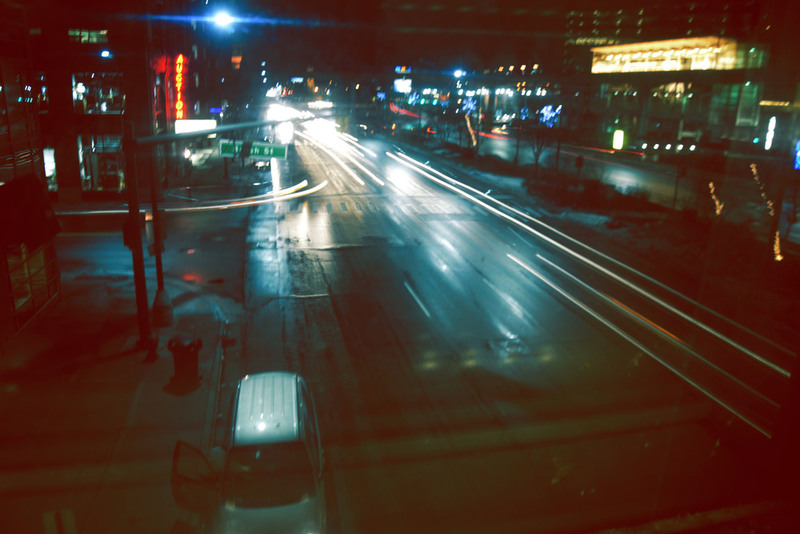 © 2014 Megan LaCroix, "Jefferson Ave."